Appalachian atmosphere should survive the transition to the small screen, but nuanced performances will require undivided attention to really absorb. 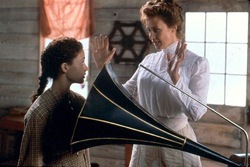 Reinvigorated by the chance to record such ancient songs for posterity, Dr. Lily Penleric (McTeer) sends for a wax cylinder phonograph and begins trekking all over the rugged mountain, asking poor homesteaders to sing for her so she can publish their songs as part of a dissertation. Met with a little enthusiasm and a lot more resistance, Dr. Penleric finds herself in the middle of long-standing conflicts between the modern world and the mountaineers' desire to preserve their lifestyle and privacy. A strong story, well researched, written and directed by Maggie Greenwald ("The Ballad of Little Jo"), "Songcatcher" boasts a whole slew of potent performances besides just McTeer's. Aidan Quinn is almost unrecognizable as Dr. Penleric's most vocal critic, a war veteran and hardened hillbilly misanthrope who plays a mean banjo but wants no part of sharing his culture with the outside world. Pat Carroll (the voice of Ursula in "The Little Mermaid") is absolutely fantastic as Quinn's mother, the choleric matriarch of the mountain who eventually warms to Penleric. 13-year-old Emmy Rossum -- a veteran of both soap operas and real opera (she has performed in more than 20 productions at the Met) -- is spellbinding as Deladis, a girl with a beautiful singing voice who is the first to truly befriend this initially overbearing outsider. The music in "Songcatcher" is at least as memorable and moving as the acting, although a little bit of sharp-key warble-and-banjo goes a long way. But as the film progresses, hackneyed characters and obligatory episodes begin to muscle in on the story, sending it into a bit of a downward spiral. There's a turncoat yokel who "has had the privilege of education" and now works for a coal company trying to buy land out from under his own kind. There's a mountain mama birthin' scene. There are city folk who consider the Appalachians "savages" and say stupid things like "if we teach them to drink tea, they'll want refinement," as if "they" weren't standing right there. But the real problem is that from the early going it's clear that "Songcatcher" is the kind of movie in which people's lives have to take a turn for the worse sooner or later. That's why the turncoat carries a gun. That's why there's this silly set-up about a panther being in the woods. And why else would Penleric's schoolteacher sister turn out to be a lesbian except to be persecuted by these backward people? After all, in the movies nobody can be gay before 1970 without tragic consequences. Oh, and let's not forget the overriding last reel lesson about What's Really Important In Life (in the case of Penleric, that would be her unexpected romance with the Quinn character). I was quite taken by "Songcatcher" and the unswerving sincerity of the major characters. But I found myself so disappointed by the formulaic elements, which all but take over the narrative, that my enthusiasm became more and more diminished the longer the movie played. There's a lot of heart here, and a lot of devotion to the music and the vanishing culture in which it flourished. Those feelings may prevail for some, but there's no denying the banal embellishments are a drag on the picture's merit.